An assessment is done to evaluate performance, quality, understanding and many other things that need to be evaluated. School Assessments are done to evaluate the school’s performance based on a standard that is set by a specific government agency that is responsible for education issues. Through assessment examples we are able to make improvements with our lives. 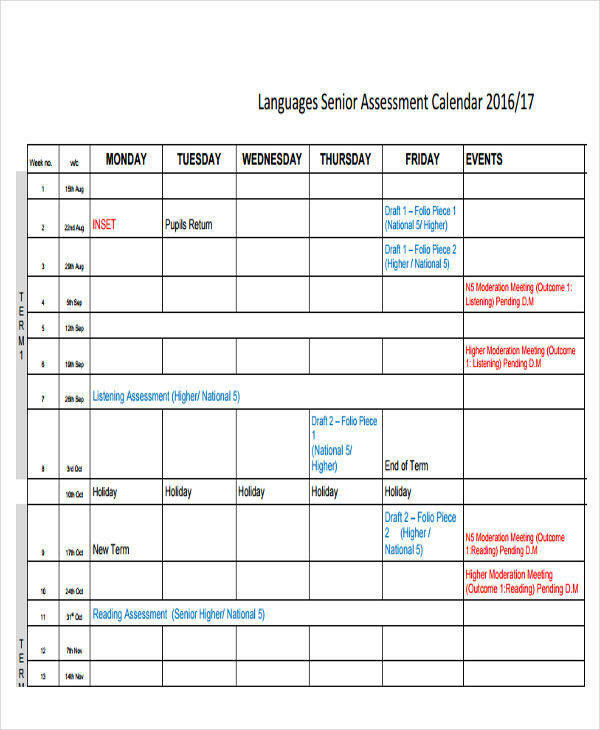 Whether you are doing school assessments or Local Assessment, the sample calendar templates that we have made available for you here will definitely be useful. 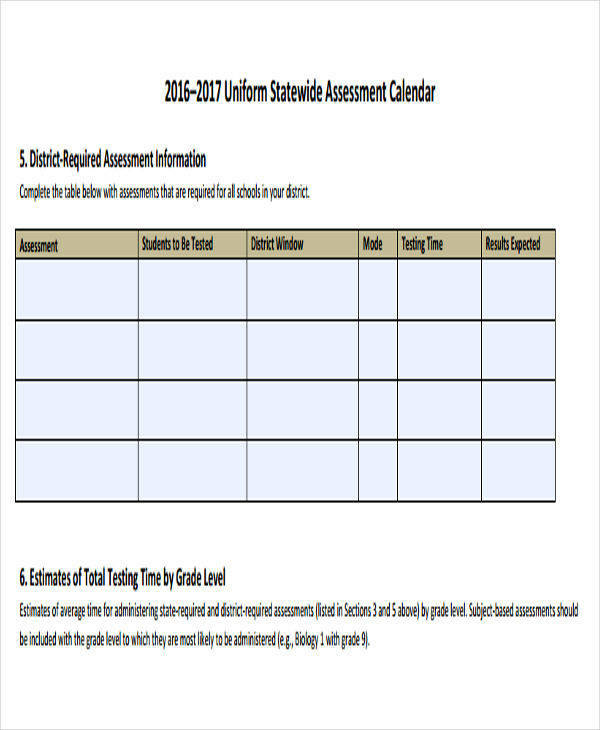 You can free yourself from additional tasks by just downloading these assessment calendar templates. What are you waiting for? Download now! 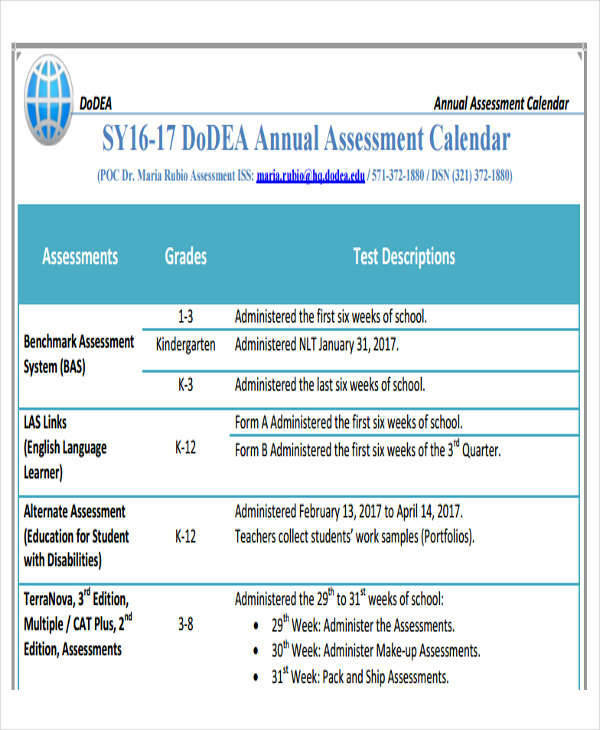 An assessment calendar is created to provide the schedule samples or dates for administrative tests or evaluations. These tests can be done through writing or written exams, or depending on the standards that are set by the department or agency that is responsible for doing the assessment. 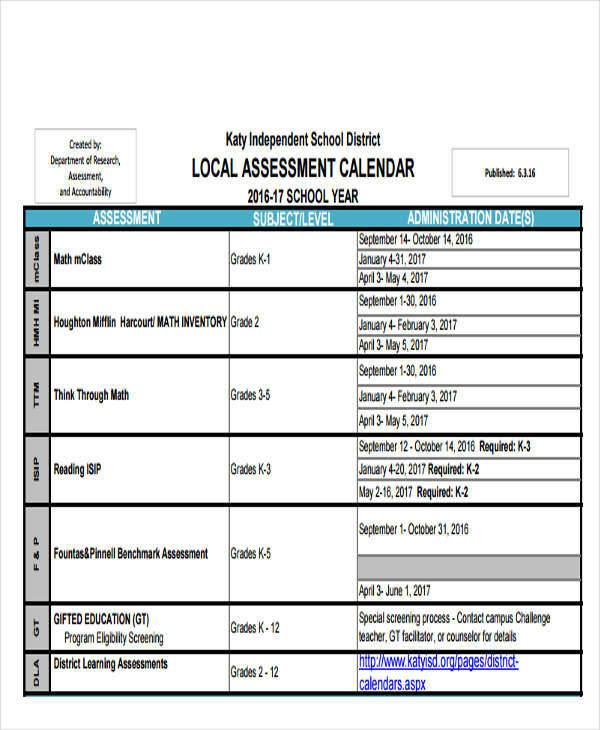 The assessment calendar is a useful tool because it helps provide a uniform schedule of activities for an organized process, especially in large organizations. Utilizing an assessment calendar helps to save time because all the things to be done next are already scheduled on a particular date on the calendar. 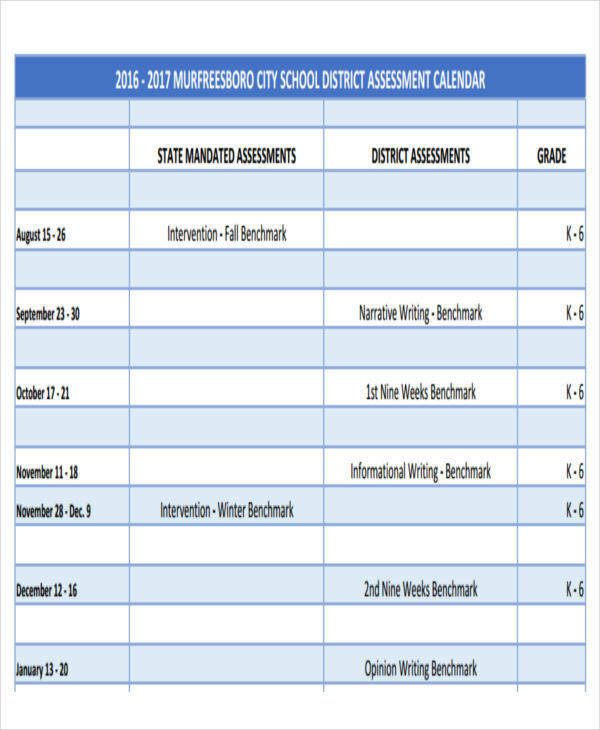 What to Include in an Assessment Calendar? 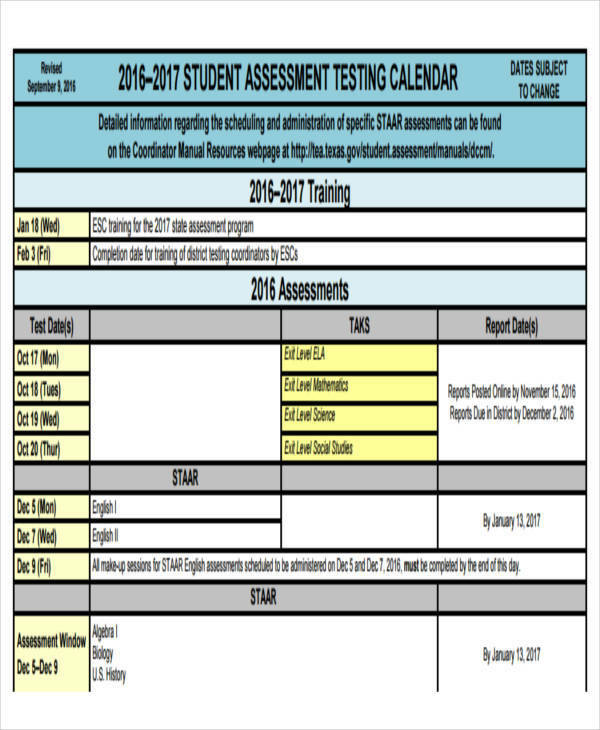 An assessment Calendar can include a lot of things depending on the type of assessment that needs to be done. For example, if an assessment calendar is created to assess schools in a specific area, then it should be about topics related to school. If the assessment is for the production of certain goods, then things related to it should be included. 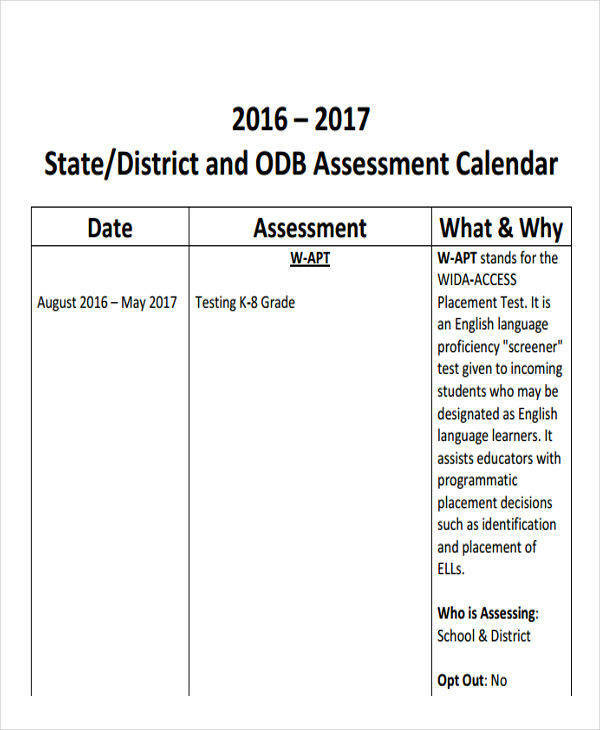 Below are some of the basic things that should be included in an assessment calendar. You may also find our homework calendar samples useful. Just like a planner or a scheduler, an assessment calendar can help in planning for a certain period of time. 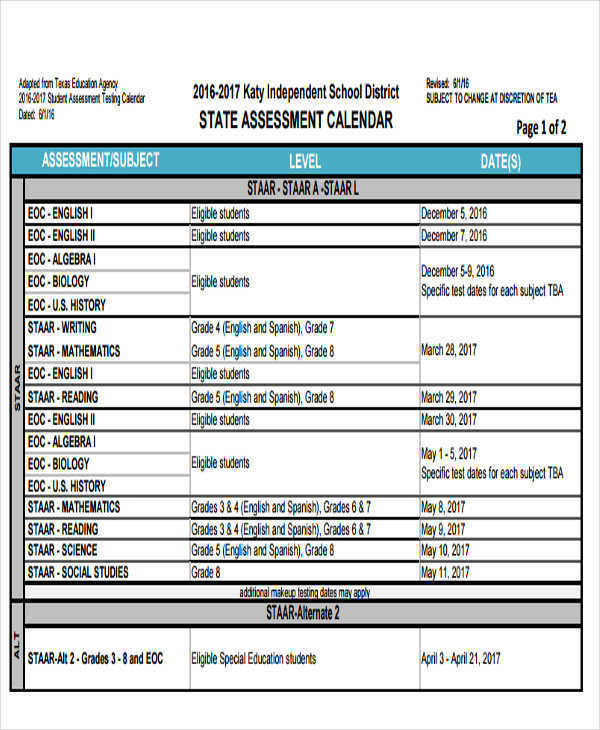 Here are some of the advantages and uses of an assessment calendar templates. It is not all the time that you get notified about important assessment dates, especially if you are in the preparation stage for adulting. 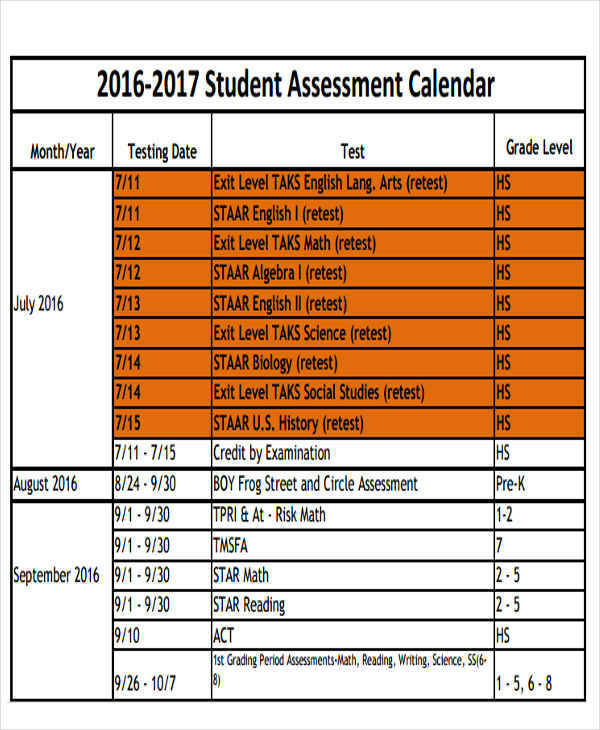 An assessment calendar can help you keep track of important assessment dates so that you won’t miss them. If you can see it written on your assessment calendar, then you will remember it. You will be able to prioritize which assessment is important and which is not. This way you will be able to determine which one to do first and which one can be done last. Having knowledge of the dates and activities to be done helps you prepare for what is to come, and may also help you avoid ignorance or embarrassment. 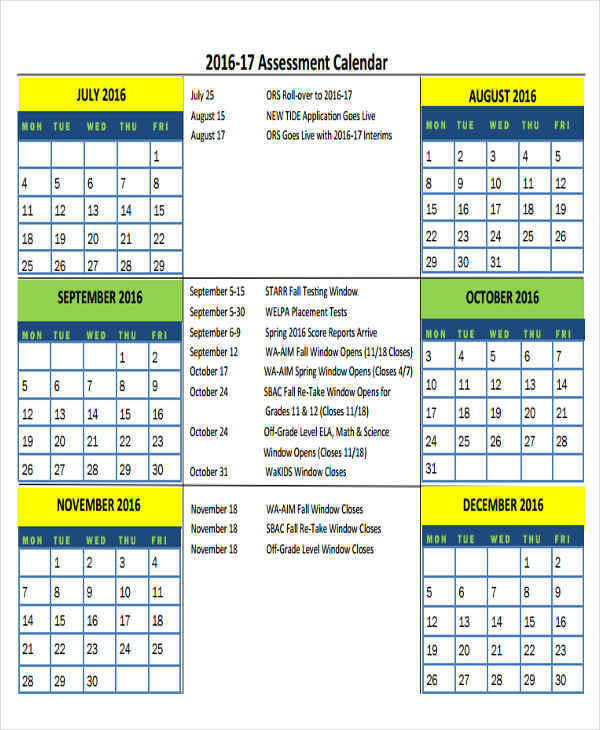 We also have wall calendar templates and weekly calendar templates available.